Former haberdashery factory. Bordschomis kutscha 2, Chaschuri. 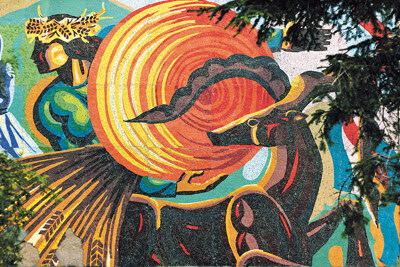 Travellers on Uzbek Journeys tours, and readers of this website, know my devotion to finding and documenting mosaic panels in Uzbekistan and Kyrgyzstan. So you can imagine my immense pleasure discovering this new book from Dom Publishers. (This group also published the excellent Seismic Modernism - Architecture and Housing in Soviet Tashkent). 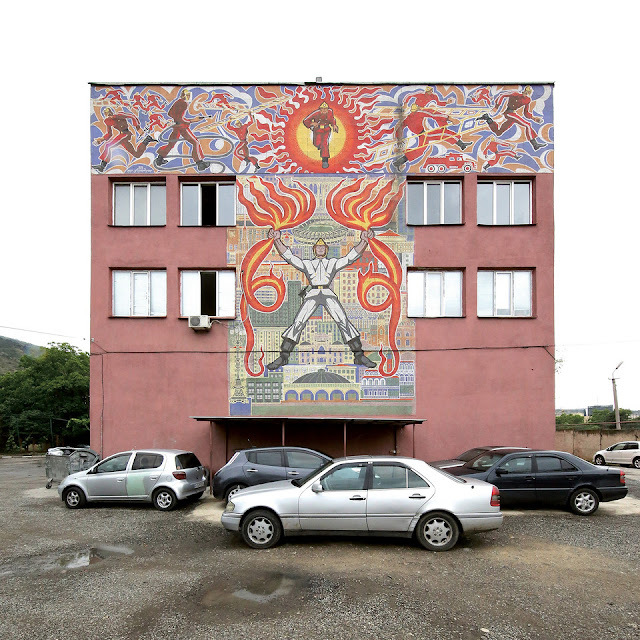 While buildings in the style of Soviet modernism in Georgia have received global recognition for several decades, the artworks created for architecture during this period – monumental, decorative mosaics – are still waiting to be discovered and appreciated internationally. These glorious, colourful mosaics were, and still are, an independent yet inseparable part of the architecture in Georgia. They express the function of the respective building, structure its facade, and sometimes even merge with it to form an elaborate whole. However, many of these artworks, which were far more than simply bearers of state propaganda, are currently under threat of destruction. This architectural guide – Georgia. 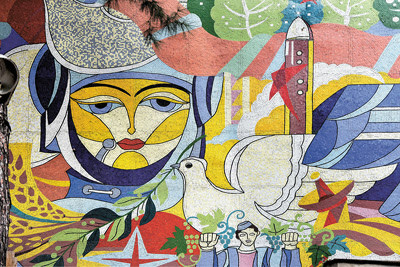 Art for Architecture: Soviet Modernist Mosaics from 1960 to 1990 – represents the first systematic documentation of these unique relics of mosaic art in Soviet Georgia. Nini Palavandishvili and Lena Prents, experts in this field, present photos and short essays to guide the reader through the multi-faceted world of Soviet mosaics in Georgia, which feature their own unique characteristics not found in other places in the former Soviet Union. 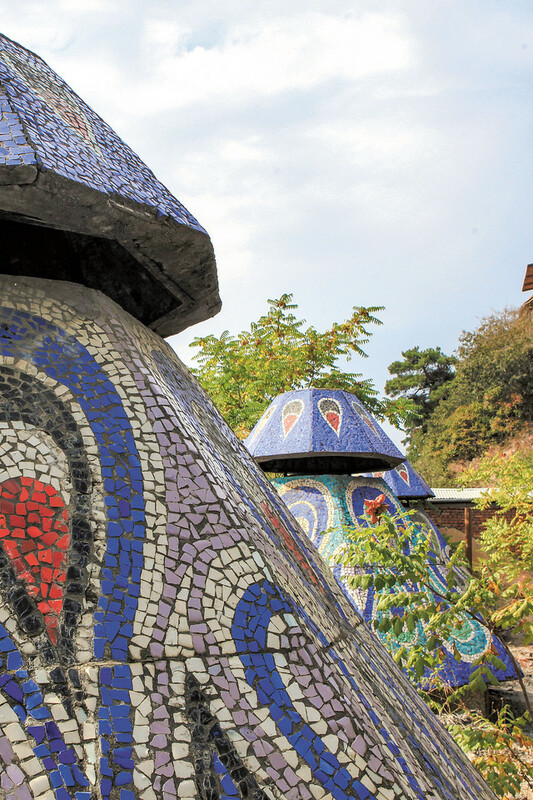 The mosaics were created not only in cities but also in villages and residential settlements. Most of them were hung on public buildings and industrial facilities, but also on canteens as well as conference and concert halls. They can also be found in the form of independent decorative wells and wall structures. 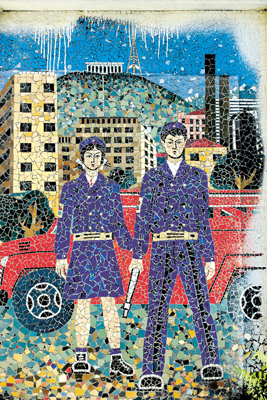 Unique examples of these mosaic-covered works of architecture include the former Café Fantasia on a boulevard in Batumi and the "bus pavilions" in Abkhazia. Bus stops bedecked with mosaics still stand in small cities; complex, three-dimensional compositions are still to be found in health resorts such as Pitunda (also known as Bichvinta) or Kobuleti. 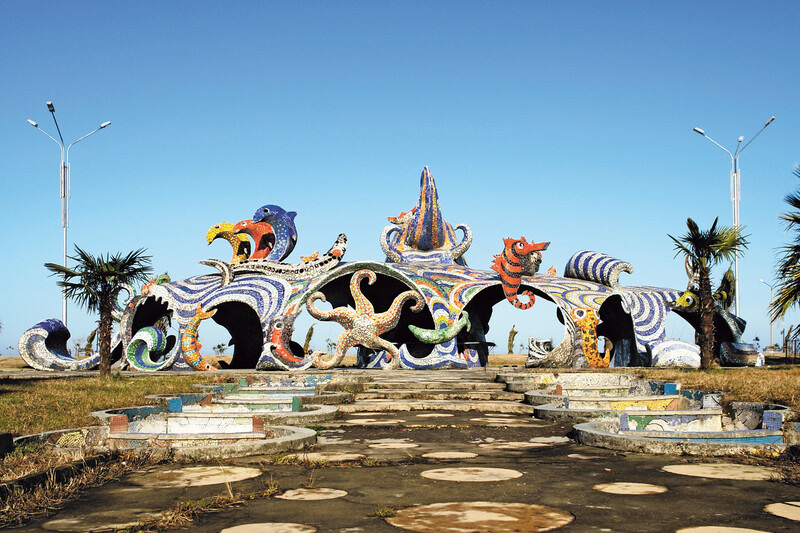 The authors draw attention to this remarkable artistic heritage of a recent past and show its cultural significance, thereby also making a powerful appeal for its protection and preservation. There are 350 splendid images in the soft cover book, which you can order directly from Dom Publishers.